Horseback riding lessons at Glendon Stables has been an enjoyable journey for me so far. It's crazy to think how much I have improved since I first started a couple years ago. Then, I would struggle to keep a trot and now I'm doing jumps and continuously cantering around the arena. For me, when it comes to taking riding lessons, I care a lot about the environment and the people. Everyone's super nice and caring and I'm encouraged every time I go. Never once while riding at Glendon Stables have I thought to give up. Glendon Stables is the official riding stable for the Canada China Equestrian Racing & Polo Association (CCERPA). In partnership, Glendon and CCERPA provides safe fun learning and riding opportunities from first time riding experience clinics to lessons and showing. In July, Fairchild TV visited Glendon to help promote riding and the equestrian sport within the Canadian Chinese community. Below is a link to the video of the news cast which features our beautiful facility and horses. Yesterday, Capricio attended the qualifying classes for the Governor Generals Cup and the Lieutenant Governor General's Cup. These classes are for Canadian bred 3 year olds horses. Capricio was bred by W. Charlot Farm and is by Caberdino out of Rio's Raphaela. He placed 2nd in the GG Cup and 3rd in the Lt GG Cup. ​We made it through our first official big-girl horse show! Glendon Stables had an awesome day! Congrats to everyone who took part, and huge thanks to all who came along to help and support Glendon's riders! I am by no means a morning person, and the 4am start to the day was a bit rough to say the least. It was a beautiful sunrise at the farm and we arrived at the fairgrounds nice and early. Between Clare, Nancy, Lauren and Sam, everything was looked after, from the registration at the office, to unloading, tacking up and schooling the horses before our classes. They looked after everything and made the day stress-free and easy to enjoy. I was surprised at how not-nervous I was. In the morning was the Hack Division. Marilyn and I finished 2nd in the Road Hack, 4th in the Pleasure Hack, and 5th in the Equitation. In the afternoon, in the Novice Hunter Division, We placed 1st in the Hunter Over Fences, 1st in the Equitation Over Fences, 1st in the Hunter Under Saddle, and 2nd in the Equitation Under Saddle. That was good enough to win Division Champion! Marilyn was a rock star! I was so proud of us!! Once upon a pony, a young girl's parents sent her to summer horse camp, and an addict was born. 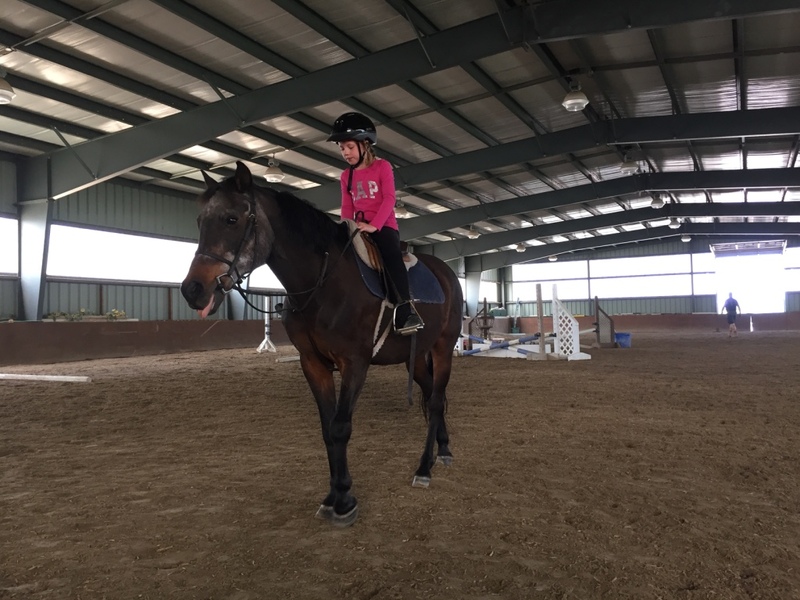 Camp soon turned into weekly lessons, and as the young girl grew up, time and opportunities to ride became less frequent, but she never stopped obsessing about horses and jumped at every chance to get back in the saddle. She read every horse book she could, watched every show jumping event on TV, and tried to learn about all things equine. Over the years, she rode on and off, when and wherever she could. She took lessons at many different barns, but never really found where she felt she belonged. Fast forward to about 4 years ago, I found myself once again longing to ride. Having had some bad experiences at the last place I rode, my confidence was shaken, which had been tenuous to begin with. 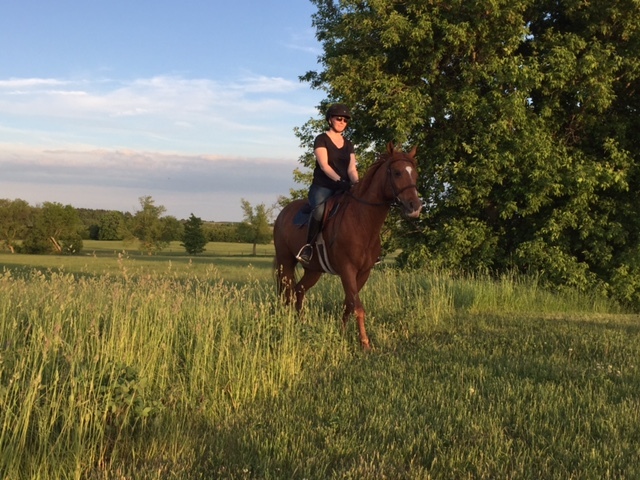 Determined to get back in the saddle, I started riding at Glendon Stables. After a few months in the riding school, I joined Nancy's program. Boy, did she have her work cut out for her! But after many, many hours of riding under Nancy's coaching, I think I have turned a corner at last. I have a new confidence in my riding, and I know my skills have improved immensely. I am now grasping concepts I had never been taught before, and understanding how correct riding is the foundation, and what that really feels like. My noodle legs are beginning to cooperate more, and I even have the occasional moment of excellence. I've had to unlearn a lifetime of bad habits and overcome some pretty intense anxiety and self-doubt, and I still work on it every single ride. Nancy has been ever-patient and consistent with me. She has pushed me when I felt I couldn't do better, or was too afraid. I've learned to trust her, and in turn, myself. Now, when that little voice of doubt and fear speaks, it's more of a whisper, and I can shush it much more easily. I now look forward to my lessons, where I used to dread them. I have found the barn where I belong. 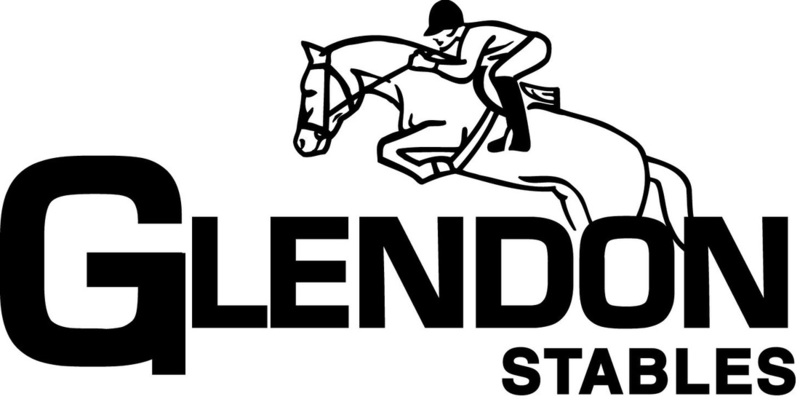 Glendon Stables is growing, and in search of a riding school instructor to start both beginner children and adults in a school geared towards show. Instructor must have some experience, be outgoing, dependable and knowledgeable with their own reliable transportation. Very generous pay for the right applicant. ​George used to belong to a client who acquired him off the track. So in a sense this is a second rescue for him. When he first came to us he was in need of some weight and retraining. As most racehorses he was slim from training and a little excitable. He quickly settled into his new routine at the farm which consisted of going out in a grass paddock with a few friends to coming in to be groomed and loved. 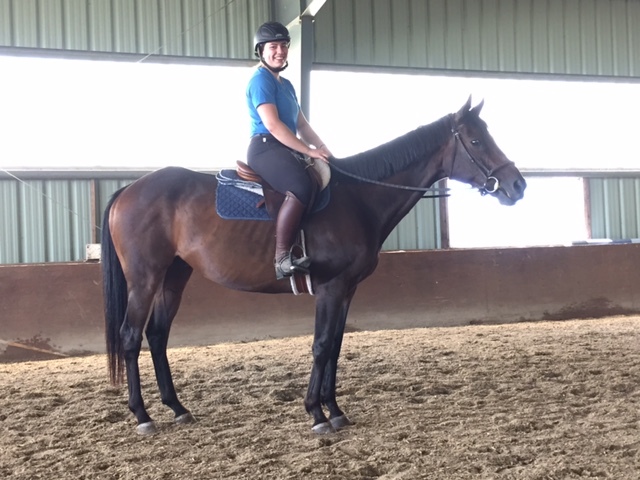 His new owner started lessons on George after about 6 weeks in his new home. They both were learning the world of hunters together. During his lessons he always tried very hard to do everything that was asked and both he and his rider excelled with his new career until she went away to university. Fast forward 5 or 6 years and George seemed to have fallen through the cracks and was found in quite a sad state. He was very thin and his feet hadn't been touched in a very long time. What had happened to George? Nobody seemed to know but thankfully somebody recognized him and gave us a call. We were thrilled to have a chance to get George back in the barn. I don't want to post any pictures of George when we first got him back but I will show you the pictures of his feet. The poor guy had one shoe on and one shoe off. 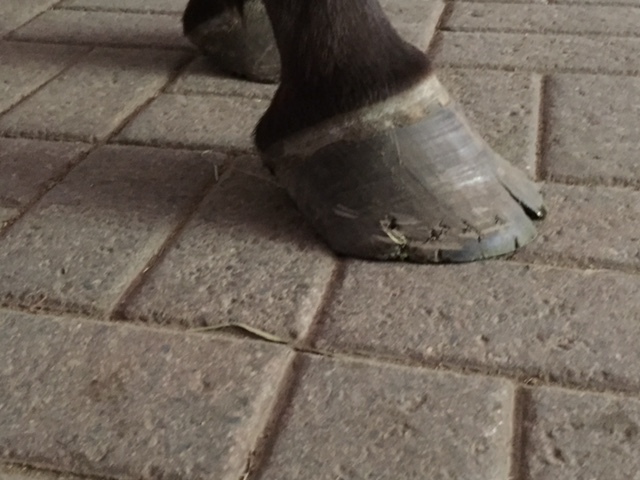 His toes had grown so long he was getting separations in the hoof wall. The still shod foot had completely overgrown his shoe. 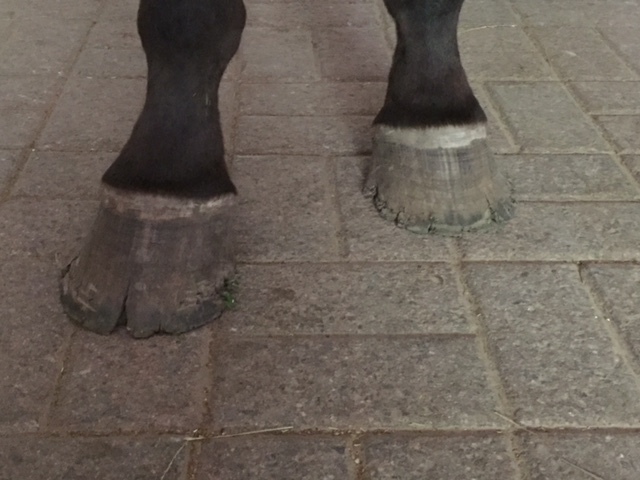 Our first job was to get his feet trimmed and back into shape. This is something that can't just be done all at once but requires a series of a few trimmings so that he wouldn't get sore. With some weight on it was now time to start him back into a slow program to help develop lost muscle. This started with short lunge sessions a few times a week gradually increasingly his work time and transitions. Finally with a little bit of muscle and some extra padding George was ready for his first ride. Only for about 10 minutes and at the walk but was he ever happy to be 'back'! 1. What type of lesson will my child or I start in? If you have never ridden a horse before, the first part of your lesson should be learning how to properly brush and tack up your horse or pony, before you mount. If you are an experienced rider who is simply changing stables, you will need a private assessment lesson to see where you fit into the new stable. 2. What are the qualifications of my riding instructor? There are various levels of coaching certifications, however, you will also come across qualified instructors who have not gone through the coaching program. 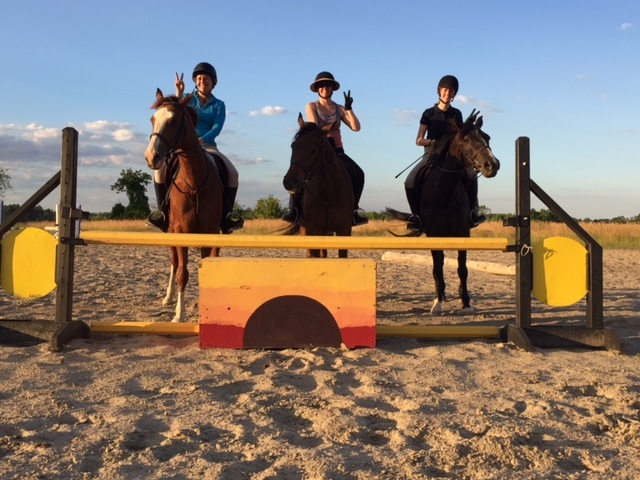 Things to look for in a coach or instructor are: several years of experience in producing quality riders; personal achievements; are personable, patient and provides clear instructions; puts the safety of rider and horse/pony first; and last but not least, you should have a personal connection. 3. What are the riding school horse’s qualifications? First, the horse should have a good temperament that is quiet and calm. The horse should be suited to your skill level and is appropriately sized to you as the rider. You will want to know that your horse has a good reputation in the school, and it is a bonus to have a veteran show horse. 4. What equipment do I need, and where do I get them? At any riding facility, safety is of utmost importance. At a minimum, a properly fitted ASTM/SEI certified riding helmet and paddock boots should be purchased before you start your first lesson. Inquiring at your new facility where these items can be purchased locally is usually the best way to go. This is generally the first question asked, and although riding lessons need to fit into your budget, be wary of choosing a stable based solely on price alone. Do your research, whether on line or through referrals, be sure to tour the facility for cleanliness and safety, and chat with the coaches and instructors. At the end of the day, you need to go with your gut, just make sure that it is informed. Glendon Stables is a full service hunter jumper and riding school facility, beautifully situated on 100 acres in Queensville, Ontario.